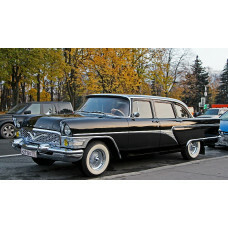 Chaika (which means 'Gull' in Russian) is a luxury car from Soviet Union era made by GAZ vehicle manufacturer. It was designed for Soviet political elites in 1959 and later widely used by party officials, academics,artists and others VIPs. This car could not be bought by an average citizen. Get back to the USSR and feel like a Soviet chairman in a luxurious limousine during this exclusive city tour!